The original Secret Restaurant Recipes invited you into the kitchens of the world’s finest kosher restaurants, bringing home entertaining and elegant dining to a new level. 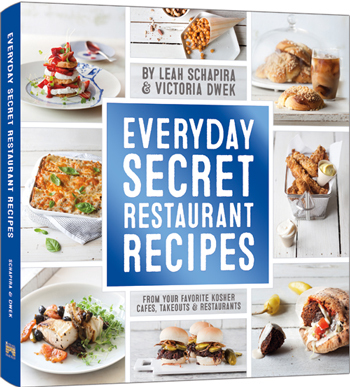 Now, in Everyday Secret Restaurant Recipes, Leah and Victoria visit more of your favorite cafes, takeout spots, and restaurants to bring you recipes that are easy to prepare for any day and every day. In addition to over 100 family-friendly recipes, Leah and Victoria share fascinating vignettes about today’s most popular kosher chefs and eateries. You’ll enjoy reading as much as you’ll enjoy cooking and eating. Bulgar Salad served in Israel’s Greg Cafe, Mahi Mahi from the iconic Va Bene in Manhattan, and show-stopping Churros from Brooklyn’s T Fusion – over 100 recipes adapted for home use, with accessible ingredients and quick prep time.